At the end of the 20th century, I was writing and publishing a lot of books about the Internet. (Everybody has to pay the rent somehow.) Some parts of these books still hold up reasonably well; others are misguided and flat-out wrong in ways that make me wince openly. But that’s the way it is with things you wrote nearly a dozen years ago. 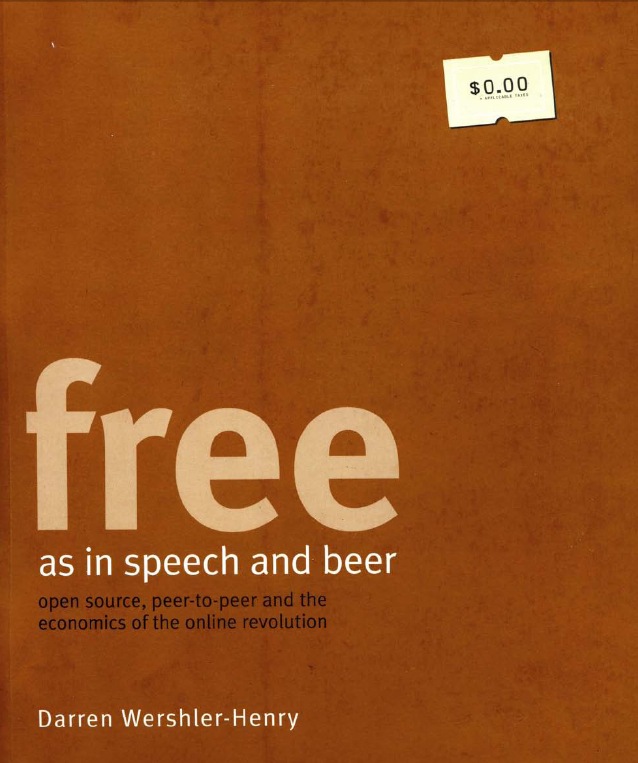 FREE as in speech and beer, which came out a couple of years later, holds up a little better, as it’s mostly an intellectual history of the notion of freedom as it pertains to sharing on the Internet. The book outlines the difference between “free as in rights and liberties” of Richard Stallman and company, and the “free as in getting something for nothing” that still drives file-sharing today, and contextualizes them in terms of the theory of potlatch and the general economy. Again, it was a lot of fun to write, and it may be of use to those too young to remember that Napster really wasn’t invented by Justin Timberlake. The rights to both books reverted to Mark and me several years ago, so they are now available as PDFs. Enjoy.